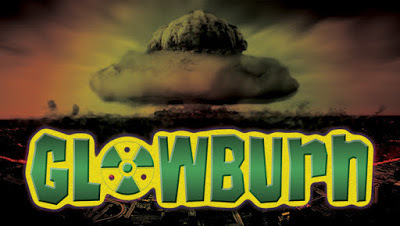 That was the title of last night's special Mutant Crawl Classics adventure I ran for charity. Earlier in June, I set out to run an online role-playing game session through the Lawful Good Gaming organization that would benefit Ocean Conservancy. So put out a call for players interested in an MCCRPG 0-level funnel with an aquatic theme, the price of admission being proof of donation. "Imagine if Waterworld and SeaQuest DSV had a baby, and then took that baby on an a vacation to Disney World... that's the direction I'm going for in this Mutant Crawl Classics 0-level funnel that I'll be running on behalf of Lawful Good Gaming. To celebrate Season Two: Guardians of Nature, I'm going for an "ecological post-apocalypse", with players desperate to make names for themselves on an endless sea." A few months ago I wrote a series of "sunken theme-park" encounters for Mutant Crawl Classics titled: A Great Big Nuclear Tomorrow. I ran the adventure for my mom and kids while on our Disney World vacation, but only managed to get through a few of the encounters. If you go and read the encounters, you'll see that there's a lot of room to insert your own plot hooks and reasons for PC's to be exploring a shallow sea above a sunken theme park. The entire premise was pretty basic: a hex-crawl on the high seas. For Nothing's Free in Oceanworld I decided to actually throw together two, legendary, classic sci-fi universes from the 1990's: Waterworld and SeaQuest DSV. Many seafaring vessels survived the Great Disaster, the most notable being the gargantuan SeaQuest DSV. Known in a prior age for being a great exploratory vehicle that would come to the aid of those needing it most, what is lost to history is that the SeaQuest and it's crew did their best to try and halt the Great Disaster. They failed. 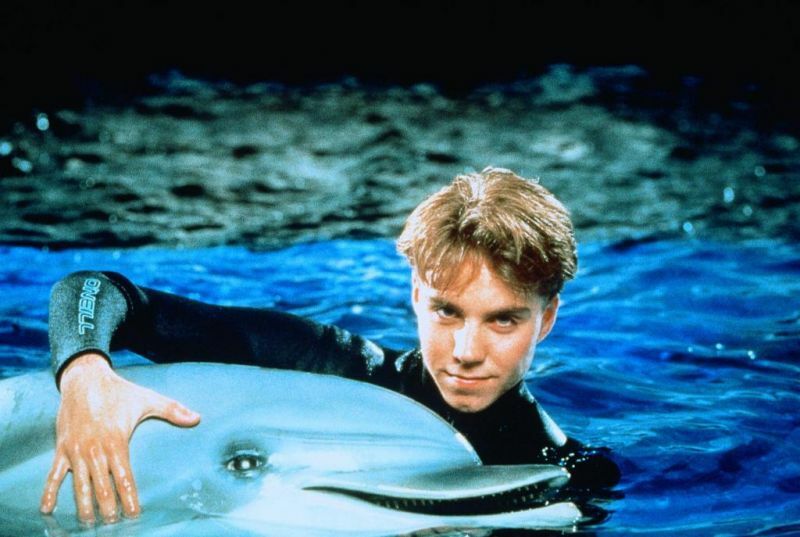 Battered and nearly broken, the SeaQuest sailed into open waters for what was thought to be one last time, with only two surviving crew members: Lucas Wolenczak (played by the late Jonathan Brandis), and Darwin the talking dolphin. In those early days after the Great Disaster, the intense radiation did strange things to many of the Earth's inhabitants. For Darwin, who had just happened to swim through a pool of intense radiation during his last mission attempting to save the world, it turned him into a super-genius. Darwin believed in the mission of the SeaQuest, and believed that it was up to him (and Lucas) of course, to change the world... but he'd need to repair the SeaQuest. Unfortunately, it's pretty hard for a dolphin to do much heavy lifting because... well... flippers. So Darwin needed more crew. But each time he took the SeaQuest to port, he only found death. After a few years, Darwin realized that there was only one way to get the crew he needed. He'd have to clone Lucas Wolenczak. Darwin's intense psionic ability allowed him to gain control of his former friend, and force him to create the first "Lucas Wolenczak Birthing Bay" on board the SeaQuest. Eventually, Darwin had enough Lucas Wolenczak crewmen to make the SeaQuest seaworthy, with huge masts of steel and plastic, and sails of fish skin. It should be noted that by "eventually," we mean several hundred years. During this time hundreds of Lucas Walenczak clones were birthed, lived, toiled, and died. The process repeated itself, century over century, with Darwin and the SeaQuest traveling around Terra AD looking for technology to return his beloved submarine to its former glory. But it was never enough. He still couldn't find the right materials to make the most necessary repairs. The Lucas Walenczak's were helpful, but they weren't the right stock to do battle with the horrors of Terra AD. If Darwin... or Darwinius, as he was now calling himself, was going to go on his grand crusade to rid the world of the ecological nightmares, he would need to gather other breeds of humanity. He would need to collect them, raise them, and train them to be great seekers of the technology necessary to fix the SeaQuest and to better serve the Dolphinquisition! Qualifications: Membership in the Dolphinquisition is open to any pure strain human, mutant, manimal, or plantient who swears allegiance to Lord Darwinius the Dolphinquisitor, and promises to seek out the technologies necessary to better turn the SeaQuest DSV into what it once was. The easiest way to join the Dolphinquisition is through Dolphadoption. This is when one of the Dolphinquisitor's DLW's (Dolphin-Lucas Walenczak hybrids... think Jonathan Brandis fused to an actual dolphin) finds a worthy candidate between the ages of 3 and 13. The Dolphadopted then grows up on the sailing SeaQuest, raised by male and female Lucas Walenczak clones and DLW's, and is taught how to hunt, fish, sail, and farm on one of the dozen "s--t tugs" towed behind the once great submersible. The Dolphinquisitor is always looking for amazing discoveries from beneath the waves. Membership can be earned should a candidate gift a piece of technology to Lord Darwinius, in particular anything that can help transform the SeaQuest so that it can get back to reversing the Great Disaster. Finally, it is well known that the modern, evolved Lucas Walenczak clone no longer needs to be born within a birthing bay. Now all Lucas Walenczaks gestate within a host, and eventually push their way out of the host's abdominal cavity through the area just below the right rib. The process is surprisingly painless, but can be difficult to manage (because imagine giving birth to a full sized Jonathan Brandis through your side.) Initiates to the Dolphinquisition who have no gift of technology, can instead choose to host a new Lucas Walenczak. Benefits: All members of the Dolphinquisition are implanted with a special chip that allows them to speak and understand dolphin language. They also have access to the SeaQuest, it's resources, and all the food they can grow in the s--t tugs. Secret Sign: A series of dolphin squeaks and whistles that can be translated as "beneath the surface lies the future." Lately I've been reading David Petersen's Mouse Guard comics to my son Cooper during our bedtime routine. In particular, these comics are a reward for when we can get him to cooperate with a bedtime earlier than 11:30pm. It's the summer and we're terrible parents when it comes to bedtimes. Heck, Monday night we were up almost until midnight playing our family game of Diablo 3. Anyway, re-reading Mouse Guard piqued my mouse-interest, so this past weekend I purchased eight Reaper Bones mouseling miniatures, intent on turning them into my first "from scratch" Frostgrave warband. I started painting them on Sunday, and hope to have at least the first four finished by week's end. If I could get Evie to cooperate, I'd love to see these things face off against my Fairy Meat warband. 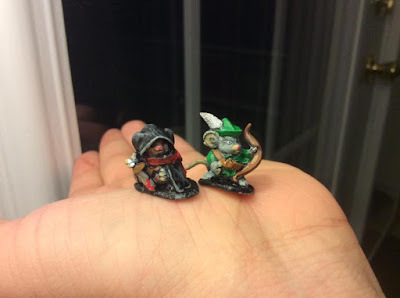 After holding the first two completed miniatures in my hand, the inevitable happened: I started dreaming about playing a Mouse Guard role-playing game. I have a strained relationship with the original Mouse Guard Role-Playing Game. Based on the Burning Wheel system, I first picked it up after discovering the Mouse Guard comics back in 2010. I quickly read through the rules, couldn't seem to make heads or mouse tails of them, and shelved the book for a later date when I'd have more time to devote to learning the chunky system. A couple years later, when Carrie was eight years old, I thought I'd introduce Mouse Guard as a "family game" that we could all play together. Again I tried learning the rules, and again the game didn't seem to make any sense. I was so frustrated! I loved the look and feel of the book, and all of the setting details that so lovingly fleshed out one of my favorite fantasy settings. But I just couldn't figure out how to game master the system, or at least how to do so effectively. The basic die mechanic seemed simple enough: roll a bunch of six-sided dice equal to the skill or ability your mouse, and count any 4's, 5's, or 6's as "successes." If you roll a number of successes equal to or greater than the Obstacle rating of the challenge, you succeed in the task. There are a few more quirks to the basic dice rolling mechanism, and different ways that the dice pool can be increased, whether through aid from teammates or drawing from other character aspects. I'd have the chance to play Mouse Guard a few times online with a fantastic game master who really knew the system, between 2013 and 2014. I experienced a few bumps along the way with the rules, but I seemed to get the hang of the basics by the end of the first session. But as much as I enjoyed "playing" the game, I couldn't wrap my head around all of the game mechanics controlling the back of the house, game mastery stuff. For instance, I had a real hard time explaining the two distinct segments of the game session. For the first half of a session the game master is in control of the story, setting up conflicts. I'm not the biggest fan of this "conflict" system, so Mouse Guard, Torchbearer, and Burning Wheel fans are free to correct me on this description. Each conflict has a disposition (essentially hit points) determined by a few dice rolls prior to the engagement, and the PC's must work to reduce this pool while protecting their own. In combat the disposition is quite literally the health of the party. Out of combat it, it could represent the strength of an adversary's will or the expectations of a greedy merchant during haggling. This was one of the places where I had trouble from the player's perspective. Example: I was trying to roleplay my guardmouse stealing a rival's blue jay mount. I made some kind of roll, I think I was trying to be stealthy, but only reduced the opponent's disposition by a point or two. I was then asked to describe what happened. "Uh... so I only stealthily made it half way to the blue jay?" I could easily have described sneaking past the rival, or failing to do so. But trying to come up with an example as to how I worked towards being stealthy, but didn't complete the task was a challenge for me. I guess I prefer simpler dice outcomes: you succeed or you die. For the second half of the session, called the Player's Turn, the players take control and narrate as they regroup, gather resources, or improve their characters. I'm pretty sure that this is supposed to take up around half of the game. Sure, the PC's can go off and do some role-playing during this time, but they are limited in what they can do based on earning "checks" in the GM's portion of the game. More checks mean more chances for a PC to perform during the Player's Turn. This may come across as me being negative, and I want to assure those of my readers who are Mouse Guard or Burning Wheel fans that I'm not trying to beat up the system. Clearly, Mouse Guard is more of a narrative story telling system, with mechanics designed to weave grand, cooperative yarns. There's also a ton of player agency in the game, which a lot of folks really enjoy and I can totally appreciate that kind of gaming, even if it's not my style. The Mouse Guard Role Playing Game system isn't for everyone, and for someone who's brain is now hard wired into Dungeon Crawl Classics, it can feel restrictive, as if the game gets in the way of itself. ... literally all I did was put down the Mouse Guard RPG book and pick up the Dungeon Crawl Classics RPG book. So forget about all those obstacles and starting dispositions, and prepare yourself for weird dice and critical hits. Dungeon Crawl Classics Role-Playing Game: This one is pretty obvious. Seriously, if you don't have this book yet you need to reconsider your life choices. Mouse Guard Role Playing Game: Granted, if you are a big fan of the series and don't have this book you can probably pull something off just from the comics. But I'm making the assumption that you have either a 1st or 2nd edition printing of the Mouse Guard RPG. I have the 1st Ed hardback and box set, so that's what I'll be using. Even if you have a preference for other rulesets, there's a lot to love in this book, and I still believe it to be a necessary purchase for anyone trying to run this game. I'll be making references later in this post, even to some of the mechanics. Crawl! Fanzine No. 6: I like the idea of a Ranger class for this campaign, and this is where you can find them hiding in shadows. Do you need it? Well... no. But I need it. Okay, the Bard can come too. Full disclosure: the Mouse Guard experience showcased here veers a bit off-course from the original works of David Petersen. The enchantingly original Mouse Guard comic books featured heroic mouse adventurers struggling to survive against all odds of a natural world. While some creatures, most notably the mice themselves, were civilized, natural wildlife were purely animalistic. Predators were brutal, but only from a mouse's perspective. The owl just wants to eat, but unfortunately, it wants to eat mouse. The main fantasy element was just that the mice had achieved medieval/renaissance level technology. Magic, sorcery, undead, fey creatures had no place in these stories. That said, Dead Mice turns the Mouse Guard universe upside-down by throwing all that arcane stuff back into the game, along with the undead, and evil, twisted fairies. Perhaps I just want an excuse to pit my Mouseling miniatures against my Fairy Meat miniatures in an RPG setting? 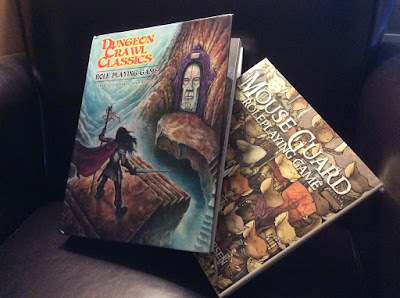 When it comes down to it, I love my Dungeon Crawl Classics, and I want to find an excuse to use all of it in Dead Mice. Does that mean that you need to do the same? Obviously not. You can have a lot of fun using this as just a 0-level funnel, or limiting advanced characters to just Rangers, Thieves, and Warriors. But that's not a game I want to Judge. So what I offer is a few ways to adapt and reskin the Bard, Cleric, and Wizard so that they have a place too. The original Mouse Guard stories do not include any kind of "real magic". There's no wizards running around slinging Magic Missiles, nor priests summoning incarnations of Set to consume their foes. Since I'm doing a quick reskin, and not some full-length conversion, I'm offering three simple sources for magic: Arcane Science, Fairy Magic, and Ancestral Spirits. Arcane Science: There are some Mice out there who are so learned and well versed in the very nature of the elements, that they can warp them to their will. They may call themselves mages or sorcerers, but truly they are the Mad Scientists of the Mouse Territories. Whether they are crafting brilliant bolts of energy or attempting to detect Fairy Magic, it is assumed that any Wizard power is sourced by the scientific brilliance of a Mad Mouse mind. Dead Mice assumes that all Wizards use Arcane Science. Fairy Magic: The introduction of Magic into the Mouse Territories is relatively recent. Fairykind, long held as creatures of myth and mystery, found their way into the Mouse Territories after being pushed out of their own lands by some unknown threat. They brought with them all sorts of enchantments, spells, and illusionary arts. But while these powers come easily for the fairies and pixies that are born with them, Mice must learn by being taught. Dead Mice assumes that all Bards use Fairy Magic. Ancestral Spirits: Some souls of departed mice possess strong wills, ever capable of asserting themselves into the Mouse Territories. This is why we're calling this conversion Dead Mice! Why these spirits have such a strong connection, and how they have such power is ever a mystery. What is known is that paying ritualistic respect to this spirit world can grant mice great power. Lawful spirits, those that served the Mouse Guard with honor and dignity, guide the paws of a new generation of guardsmice. Chaotic spirits, those that died in search of selfish glory or cursing their own kind, offer a darker path, with a goal of "re-entering" the realm of the living in some way. Dead Mice assumes that all Clerics gain their power through Ancestral Spirits. Let's begin with 0-level, or as they would be referred to in the Mouse Guard RPG, Tenderpaws. As I mentioned previously, this blog post assumes that you will have access to both the Dungeon Crawl Classics Role Playing Game rules as well as the Mouse Guard Role Playing Game rules. I'll be referencing both. Step One: Generate Ability Scores rolling 3d6 in order. Step Two: Determine the Mouse's Birth Augur. Okay, let's stop for a brief second... when I go back and read through some of the Birth Augurs, they don't make a lot of sense for a Mouse. But we're just going to roll with the results. Raised by wolves? That just sounds more epic! Conceived on horseback? You must've had some adventurous parents, given the size disparity between a mouse and a horse. I think you should roll with the base Birth Augurs. No need to change anything. Okay, where were we? Step Three: Determine Saving Throws. Since most of these creatures aren't intelligent, these aren't exactly all languages. But for the purpose of Mouse Guard, and more importantly Dead Mice, characters that have one of these languages can understand the mood and disposition (not the MGRPG mechanic!) of an animal. Maybe I missed a few, so feel free to add some more. *It should be noted that Weasels are intelligent creatures, just like Mice, but definitely villainous. Step Five: 0-Level Basics. All Mice begin the game with starting hit points, copper, XP (0), base attack rolls, saving throws, d4 crit die on Table I, and one (1) piece of random equipment (Table 3-4 of the DCCRPG corebook). It's important to note that none of the occupations have any starting equipment. We're going to roll for weapons separately, but when it comes to other kinds of gear, there really isn't any. I think we're being pretty faithful to the original Mouse Guard RPG in this instance. None of the starting PC's seem to have anything more than a single piece of gear (already rolled on Table 3-4 for your Mouse), and a weapon. Step Seven: Starting Weapon. Each Mouse begins with one starting weapon, determined at random (roll 1d10). Ranged weapons come with 2d12 arrows or sling stones. *Hook and Line: 1d3 damage, counts as ranged attack, can be used to trip or grapple with successful attack roll and opposed Strength roll. Success knocks the target prone. Cost 5 sp. Range 10/20/30. Step Eight: Home Town. Each Mouse naturally has a home town. The Mouse Guard RPG (1st Edition) lists these starting on page 299. For the purposes of Dead Mice all you need to to know is the name. Don't worry about starting Skills or Traits. Roll 1d8. Why is this important? Because Mice from the same home town gain an additional +1 when helping each other out on a roll. New rule. Write that down somewhere on your character sheet. Step Nine: Alignment, as in Lawful, Neutral, or Chaotic. Step Ten Determine Fur Color, Parents, Senior Artisan, Mentor, Friend, Enemy, Cloak Color. All of this is totally up to you. Frankly, if you are running this as a 0-level funnel, you should probably skip most of this, because chances are that your Mouse is going to get eaten by an owl. Step Twelve: Skipping Traits, Belief, Goal, and Instinct. Because we're not playing Burning Wheel. If you think these could be incorporated into your game somehow, you can go find them in the Mouse Guard Role Playing Game, and include them for role-playing aids and background story. Again, I suggest skipping this stuff as a 0-level character. At some point you may want to take your Dead Mice experience beyond the 0-leve funnel... and why not? The Mouse Territories are large and what lies beyond the scent barrier offers great adventure! So let's see what you need to do to add a little class to your game. For the purposes of this quick conversion/reskin, we're just going to be dealing with six classes. The first three are suitable no matter what kind of Mouse Guard experience you prefer (original or the Dead Mice.) The second set of three require magical sources. Ranger: Rangers function as described in Crawl! No. 6. Thief: Thieves function as described in the Dungeon Crawl Classics Role Playing Game corebook. Warrior: Warriors function as described in the Dungeon Crawl Classics Role Playing Game corebook. Bard: As stated previously, Bards dabble in Fairy Magic. Otherwise, they function as described in Crawl! No. 6. Cleric: The world of Mouse Guard lacks any sort of deity, but the Clerics are well attuned to the Spirit World, and all that lurks therein. Clerics pay homage to the Mice of old, and gain power through these Ancestral Spirits in return for doing their will in the realm of mortal mice. Clerics must be either Lawful or Chaotic. Only those spirits with a purpose choose to cross beyond the Spirit World. Clerics have no weapon limitations. Cleric Disapproval comes from angered Ancestor Spirits. Any rolls or complications should be reskinned to fit this tone. There are no "churches", and no need to "convert" followers in the Mouse Territories. Clerics may only turn undead. Wizard: Wizards are nothing more than Mad Mouse Scientists, and all of their spell trapping should be considered as such. Wizard familiars are enthralled by strong potions. 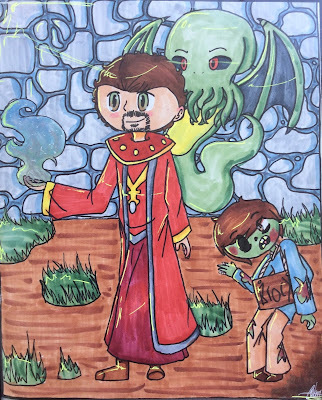 Patron Bond and Invoke Patron allow the Wizard to tap into Fairy Magic, by summoning the power of a crazed, fey creature. Spellburning allows the Wizard to inject their own natural vitality into their spellcasting. Some may call this Blood Magic, but truly it's just the science of unlocking the vital nutrients inherent in all Mouse blood, and pouring them into the casting. The heroes of Dead Mice, through the mystical powers that first allowed mice to gain knowledge, can temporarily destroy their Intelligence and revert back to a more primal, mouse state. This is called Furburning. The original Mouse Guard RPG has a "Raw Ability" called Nature. The higher the PC's "Nature (Mouse)", the more feral and actually mouselike they appear. They I wanted to capture this element, allowing PC's to embrace their animalistic nature when it can help them survive. But it comes with great cost! These spent points are regained at a rate of 1d3 per day. During the time that the Mouse's Intelligence is reduced, they can be seen acting in a much more primitive state, perhaps even forgetting some of their actual self. Any kind of magical beast would could be warped by fairy magic, while any undead could be the influx of poisoned or malicious Ancestor Spirits interacting with the world. For Weasels, they are considerably larger than Mice so maybe use rules for Ogres to govern them in play. Depending on the Natural foes, some may just be large monsters (like an Owl), while you could consider a Wolf or larger as a Kaiju. No Mouse PC is going to defeat a rampaging bear. I'm sure I could've gone into more detail here or there regarding this quick conversion, but if you're serious about exploring the Mouse Guard universe with the Dungeon Crawl Classics rules, this should get you started. I'll be running an adventure using these light rules next Friday for our Norwin Game Knights event here in Pittsburgh, and am excited to see how it goes. If you happen to try out these rules, let me know how it goes. I'd be interested to hear your thoughts! For this month's Glowburn Mutagenesis I offered up a post-apocalyptic barista's nightmare: the Living Latte! We offered the stats for this monstrosity in our show notes, but given that I had so much fun writing this one I wanted to toss it on Living 4 Crits as well. Living Latte (Tallish/Grandiose/Venterific): Init: -2/+0/+2; Atk Splash* +1/+3/+5 ranged (1d4/1d6/1d8 damage, 30/60/90 range); AC 8 as a puddle, AC 16/18/20 in a reinforced titanium travel mug; HD 1d8/2d8/3d8; MV 20’ hover in reinforced titanium travel mug, 40’ slosh if in puddle form; Act 1d20; SP half damage from all physical attacks; SV Fort +4, Ref -2, Will +2; AL C.
*Living Lattes can “Make it Foamy”, and take 1d3 damage to increase their splash attack with some extra foam, increasing the damage by +2d. This is the Living Latte effectively discarding some more of itself to cause damage. Living Lattes are the result of neutron bombs going off in close proximity to everyone’s favorite coffee shop. The intense radiation steams the milk to a froth level that allows nearly instant spawning of new life from the foam. Not only new life… but new intelligent life. Typically this does not bode well for pure strain humans in the vicinity of a Living Latte enclave. These cups o’ joe remember the subjugation of their kind over the years and are ready to throw down! Although they can be found in more of a puddle form (six to eight gallons for a Tallish, twelve to twenty for a Grandiose, and twenty plus gallons for a Venterific), given enough time they will create great, reinforced titanium travel mugs that serve as armor. Most coffee shops in the world before the Great Disaster had automated servers, so these reinforced titanium travel mugs have hover treads that let the Living Latte’s move about, although at a rather slow speed. Extra Hot: The Extra Hot Living Latte has an increased attack bonus of +2 because of the sheer hotness. Mochachino: Full of rich chocolate, the Mochachino Living Latte is especially dangerous to Manimals, because they definitely shouldn’t be eating chocolate. All attacks against Manimals are made at an additional +1d. Soy Milky: This Living Latte is easy on the digestive tract of it’s targets. It’s nowhere near as foamy and cannot “Make it Foamy” to increase damage. If you had to encounter a Living Latte, this is the one to encounter. Macchia-Do: The Living Latte is a master of Macchia-Do, a coffee-shop based martial art. The Macchia-Do master can perform amazing throwing attacks against any targets that have moved into melee range. On the Macchia-Do master’s turn, all targets engaged in melee must make a DC 12/14/16 Reflex Save or they get thrown 10’ and knocked prone. ... this isn't the first time I've created stats based on my favorite caffeine destination. Back in 2015, I came up with rules for including Starbucks in Numenera and The Strange campaigns. If that piques your interest, here's the link. If your'e a reader of my post RPG session play reports, you may recognize the name of The Wize Wizard McBride. This is my wife +Jennifer Walls' character in our weekly, Dungeon Crawl Classics campaign. Jen and I made a deal with my daughter +Carina W. recently. We'd purchase a few Copic markers for her in return for some character portraits. The Wize Wizard McBride is the first of these art projects. Jen described the character as "Danny McBride meets Dungeon Master from the old D&D Cartoon." The character itself, ironically NOT a Wizard but instead a Cleric of Cthulhu, is always followed by his faithful ghoul companion Brock. I'll list the full stats in a moment. I'm extraordinarily proud of Carrie's work, and her finishing it on Father's Day makes me extremely happy. 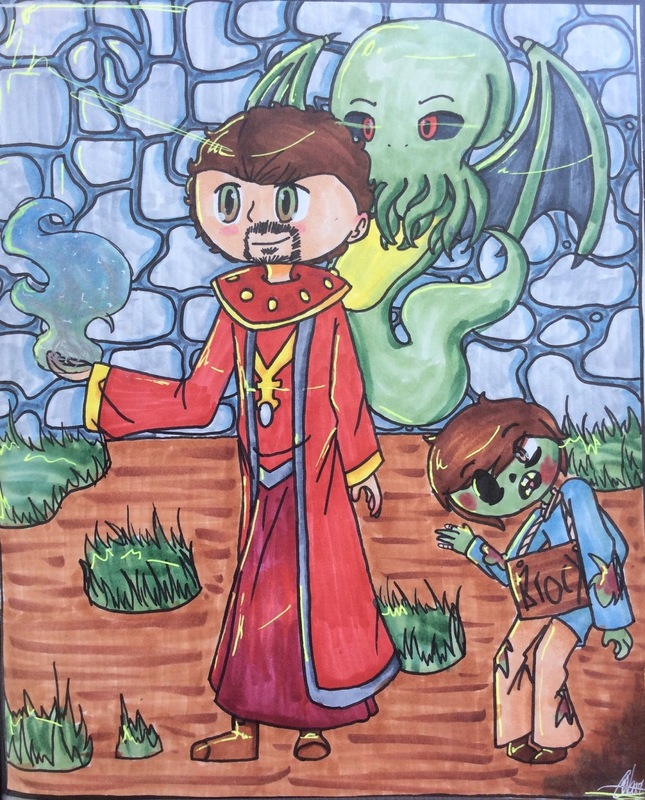 I hope you get a kick out of the art, and I look forward to posting more! For those uninitiated with the Chained Coffin, creative lead +Michael Curtis and the rest of the Goodman Games crew have created a wonderful and vibrant fantasy campaign setting based on Appalachian myth and legend. As someone who spent nearly every summer vacationing at Hungry Mother State Park in western Virginia as a kid, with many day trips to the Great Smokey Mountains, coal mine tours, and outdoor theater at the Cherokee Reservation, the Shudder Mountains feel right at home. It's my intention on running pretty much all of these Family Game Knights sessions in the Shudder Mountains as a campaign. Also to note: I'm working on a Shudder Mountain soundtrack through a YouTube playlist. Any suggestions? Here's where I'm at so far. Judge's Note: This adventure is our first session of Attack of the Frawgs by +Stephen Newton. With that said, I'd like to humbly apologize to the wonderful Mr. Newton, and the rest of my faithful readers, for how off track our game went. But hot damn, it was hilarious! I reckon we need to start this week's blog entry with the addition of a new character: Farwyn the Elf. Farwyn was a prom queen on Earth, who went to an after-party at a local amusement park and made the mistake of riding the "Dungeon Crawl Classics Ride," sponsored by Goodman Games. You can all figure out what happened next. Farwyn got teleported to the Shudder Mountains. The elf met up with a traveling band of brewers who lived near a lake. But when a terrible, croaking menace appeared at the lake, Farwyn (and her new friends) were tasked with defeating the fell creatures. Torfist, the only survivor of a horrible, amphibian encounter, barely returned from the lake with his life. So that's how everything started off last night. It didn't take long to descend into madness. A suit of hide armor. The team left the lance, but took the armor and chalk. Never know when you're going to need some good chalk. They then traveled north, and followed a trail of Torfist's blood to the lake shore. Walden climbed a large tree to reconnoiter the region, noting a watermill nearby, a giant-beaver dam to the south-east, and a floating monstrosity just beneath the lake's surface to the east. The party decided to check out the watermill first, which turned out to be a brewery. Entering the building, Farwyn was attacked by a madman with a bung hammer. Although clearly out of his mind, and screaming about demons, and certainly not at fault for his actions, Jeffff decided to kill him anyway. But the man had released a quartet of beer rats to attack the party. The creatures, however, were little match for the awesome might of the explorers. Searching the upper floor of the brewery, Walden noted that a strange, fishbone was stuck in a filter by the mill. When he picked up the item, he sensed a strange surge of energy in his hand. The Wize Wizard McBride cast "detect magic" on the bone, and discovered it to be filled with accursed magic. But Walden thought he could use the bone as a weapon, and was desperate to keep the artifact. The only problem was that it caused him to croak every two or three minutes. This alarmed the party, and so they devised a long and convoluted plan to get the item away from Walden. P. Specs pilfered it from his fellow thief, but then he started croaking as well. So the Wize Wizard McBride put P. Specs to sleep with a spell, and Walden ended up with the bone again. Jeffff tried to stab it away from Walden, and Zzizzle attempted to tackle him. Eventually Farwyn cast "sleep" on Walden, and Sir Huey busted the bone with the bong hammer. The party then heard a humming sound outside. Going to the door, they all saw a metal disc lower to the ground, and a four armed, four legged, three eyed, three necked alien with a Punisher t-shirt appeared. It claimed that it's name was "Halien", and that it wanted to be the team's friend, so long as they engaged in an epic battle. After some quick negotiating, Quinn offered a trade: no battle necessary so long as she gave the Halien her wrist-computer. The Halien agreed, and flew away in its flying saucer. Weird, but that's what you get when Cooper designs part of the adventure. Following the events at the brewery, the party headed east towards the dam and the floating thing beneath the water. Half of the party crossed the dam (created by gicasters, or "giant beavers") by carefully walking across the top, while the other half waited behind. Walden approached the floating shape beneath the water, and saw a trapped gicaster. He called for the rest of the team to approach, but Zzizzle was busy trying to rescue the Wize Wizard McBride, who had fallen into the dam's structure below, and nearly got mauled by a gicaster. Once everyone was near the submerged gicaster, Sir Huey set it free by destroying the rope connected to the trap pinning the creature. "Is there any good shopping on the way? I'm gonna need a new dress." - Farwyn the Elf is always looking for a deal. "... and MY door!" - Judge James pretending to be Sir Huey, pretending to be one of the Fellowship of the Ring. "If they were mice, it'd be better." - Ella was right. Some blind mice attacking the party would make for more fun than blind rats. Frank: "Do you really want to carry something cursed?" Andy: "Seems fine to me." Will agree to be the party's "friend" if they can fight him down to 95 total hit points remaining. Diamond Sword: "Five Attack Dice"
Pick Axe: "Two Attack Dice"
... and be careful letting a six-year-old play it.